Every two years since 1992 choirs, instrumentalists and dancers, representing cultures from all parts of the globe, assemble to share friendship and express their disparate faiths in the breathtakingly beautiful Italianate churches of the Allgäu. The 18 C summer residence of the Archbishops of Augsburg, which was located in Marktoberdorf, has been transformed into the Bavarian Music Academy. Marktoberdorf remains a small, rather isolated town in South West Germany, but it has become famous for its music festivals, notably the biennial Musica Sacra International , where a concept unique in Europe, and possibly in the world, has flowered. It is the brainchild of the charismatic Festival Director Dolf Rabus , who conceived Musica Sacra International as a small but significant way to promote mutual understanding through music, in the context of the fragility of peace, with globalisation of violence, regional intolerance and international conflicts fuelled by rigorous compliance to religious principles and, indeed, false interpretations of religious writings. There was initial resistance in this predominantly Catholic area; some priests were at first reluctant to have representatives of all religions, Hindus, Muslims, Buddhists and Jews (the Upper Galilee Choir pictured here) to perform in their churches, but prejudice has been overcome and an enthusiastic public gathers in each of the concert venues, supreme jewels of High Baroque. Attesting to the importance and aims of this festival, local people receive very many performers into their homes with great generosity. 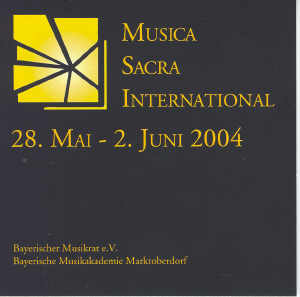 Despite all the vicissitudes and financial difficulties which beset most cultural initiatives, Musica Sacra International is firmly established as a fixture on the European cultural calendar and an encouraging demonstration of faith in the possibility of music to foster international friendship and understanding. Many of the concerts we attended were packed to overflowing, even in some of the largest churches, with audiences attending patiently to exotic musics which will have been unknown to most listeners. After a slowish start in 1992, the festival has really taken off this year, with half of the concerts sold out. Some of the artists we saw and heard were visibly taken aback by their invariably enthusiastic reception, for example a group of five Tenores di Bitti from Sardinia, who intoned esoteric primitive chants with an extraordinary guttural inherited sound, continuing for most of an hour. It is so strenuous for the voices that, as shown, one stands aside for a rest whilst the other four sing! The Tenores have a CD of sacred and 'profane' music on SIAE BLU 032. Contrasting juxtapositions were the rule; at St Martin's, Kaufbeuren the Tenores were followed by a Jazz Requiem by Swedish composer Nils Lindberg, with choirs, amplified solo singers and the Bavarian State Youth Jazz Orchestra, who gave its Austrian and German premieres during the Musica Sacra days at churches in Bregenz, Kaufbeuren & Kempten; a unique combination for choir and 'real' jazz. Its expressivity veered between soprano and brass giving a spine chilling intimation of screamng souls in purgatory and intense quiet lamentation as a dialogue between keyboard and baritone saxophone. A celebratory, riotous Sanctus must have grabbed the attention of the All-Mighty above. A palpable hit, and one which attracted younger audiences to these concerts of sacred music! Its professional premiere in Stockholm (1994) is on Phono Suecia PSCD 78 and the Kaufbeuren concert with Tenores di Biti & Lindberg's Requiem is available from MSI(K08). This Jazz Requiem is a work which merits wide international currency. Another typical festival programme had the Italian organist Leonardo Carrieri playing Paquini, Bach/Vivaldi etc on a brightly toned instrument, followed by a lengthy raga performed by the left-handed violinist Manoj Baruah with such stunning virtuosity as to make Paganini sit up in his grave - he will be playing at the Pandit Nehru Centre in London September 7. He was partnered by Soumitrajit Chatterje, tabla, coaxing the most refined sounds with fingers and hands alone. Both players displayed immense concentration keeping the underlying tension at high pitch even through interruptions during lengthy climaxes to adjust the tuning (CD MSI K12). This concert had also the Vassil Arnaoudov Chamber Choir from Sofia in Bulgarian-Orthodox music (banned from 1944 until 1989 under the communist regime); intensely beautiful singing under their director Theodora Pavlovitch, who also gave a lecture on Whit Monday in the academic programme which supports this festival (most of the lectures are given in English as the lingua franca in this international choral world). Another ambitious event had the Goeyvaerts Ensemble from Belgium giving an accomplished account of Schnittke's demanding Choir Concerto and an intricate setting of words by St Francis of Assisi, a Marktoberdorf commission from Gianfranco Grisi , their composer in residence last year, who had been set up in a composing hut in the Music Academy grounds. In contrast with Mahler's Austrian lakeside retreat, the Marktoberdorf resident composers are required to be available to receive all comers whilst composing there for four hours a day; some visitors had thought all composers are dead! The Goeyvaerts Ensemble ended with the ubiquitous Agnus Dei, an arrangement of the Samuel Barber adagio; ideal to show off their sumptuous tone in the superb acoustic of the extravagantly decorated Holy Cross Church of Landsberg. Amongst several memorable concerts, one of the most remarkable happened at Altenstadt, beginning late because of the organisers' determination to accommodate all comers. Six young singers of the Finnish ensemble Rajaton have forged a unique sound, magnificent as reflected by the curved wall of the Romanesque church's apse. They presented sacred compositions and special arrangements made for them. Rajaton means boundless, unlimited, and this personable group has won international regard in music enco mpassing pop and folk music as well as the sacred music they brought to this festival; in the post-concert partying every night, sometimes till 4 a.m, we heard Rajaton give their version of a Rolling Stones favourite. Rajaton was coupled in this concert with a sequence of Nepalese dances, the exotically costumed Charya Nritya-Dance Mandal dancing around the Allenstadt altar to delight and acclamation (CD K14 from MSI). There were only very few disappointments and miscalculations. The Ugandan choir from Kampala would better have avoided the type of hymn which derived from the baleful influence of British colonisation; their technique was inadequate for European derived repertoire. However, they came alive when connecting with their own culture; with traditional rhythms, accompanied by drums, woodblock instruments and shakers, they warmed up the audiences with infectious dance. There are daily 'cultural tours' to the concerts in the area and coach trips through spectacular countryside which take in wonders such as King Ludwig's bizarre Wagnerian Royal Castle of Neuschwanstein . Meals (veritable banquets) were organised in august historic surroundings, all for very modest cost; ideal for visitors from abroad. Invited guests, including some fifty press representatives, were looked after in style under the caring oversight of Anne Roth, who thought of everything. There was shuttle transport when necessary to and from accomodation and to chosen venues of our own choice. The documentation for these festivals is impressive. The indefatigable Dolf Rabus, seen with Brigitte Riskowski (Festival Manager) and Anne Roth (Public Relations), involved himself in all aspects of the exercise, including production of the excellent programme, is insistent that it is essential to provide words and translations for fuller understanding at the concerts (something for which we have long campaigned). The festival programme books have learned articles by specialists which discuss in depth the music of the different cultures represented. There are fine quality CDs of each concert programme, made in MSI's own studio and, miraculously, put on sale the following day; several of them recommended above. The subsequent double-CDs of each of the festivals have become collectors' items of lasting interest. There are also comprehensive CD-ROMS with many hundreds (!) of superb photos of each day's events; marvellous souvenirs for the participants, and a few of the these from the final joint concert at St Martin, Marktoberdorf, are represented here by kind permission of MSI (the larger groups look great on computer, but it is necessary to keep illustrations small to avoid making the report too slow to upload). The compilation CDs are suitable for general purchase; well selected and balanced programmes of a satisfyingly high performance standard, in live recordings which capture the advantageous acoustics of all the churches. The professional production, illustrated and with texts included, is uniformly excellent - they are well worth acquiring. This is an amazing organization!